Hello all! Moving forward, I’ll be interspersing some articles that I find relevant to me as a leader of a congregation and a family. 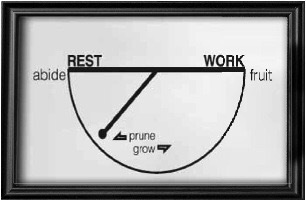 The idea is that we find rhythms: daily, weekly, monthly, annually… Why? God calls us to rhythms. Jesus went off in the morning to pray… Adam and Eve were created, then rested (the first Sabbath) and then went to work… Does this resonate with you??? Are you Resting too much??? Working too much??? Ask a loved one to rate you on a scale of 1 (poor) to 10 (great) on how well your rhythms are working out right now… You could get an answer you didn’t expect. I posted the following on Twitter recently, a message having to do with Working too much. This is a quote from and a link to a Craig Nieuwhof’s leadership podcast. Enjoy! Part of what I love about Craig Neiuwhof’s podcast is that he includes lots of show notes and 3 actionable steps that are a catalyst towards action. Enjoy! This entry was posted in Growing Leaders and tagged Leader, Rest, Work, Workaholic. Bookmark the permalink. ← You Want Me to Do What?? ?